The ATS / Applicant Tracking System application provides a free job posting feature to help you get more candidates. Each job advertisement posted will appear on career sites, official website karirpad.com and more than 450 media colleagues in major cities such as Jakarta, Bogor, Depok, Tangerang, Bekasi, Surabaya, Medan, Balikpapan, Samarinda, Malang, Bali , Bandung, Palembang, Samarinda and other media throughout Indonesia. 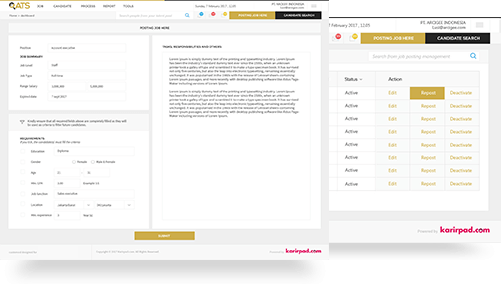 With the job management feature, you can customize the contents of job adverts in accordance with the job description and job desc position required by your company. 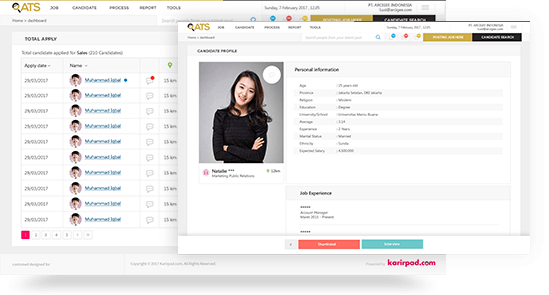 Various job setting features from Applicant Tracking System Karirpad include job positioning, job type, rank level, salary arrangement, gender categorization, minimum education, graduation rate, age, location to minimal experience. The Applicant Tracking System as HRIS / HRMS helps recruiters sort the candidates quickly according to the qualification of those positions. Thus, you will have your own talent pool and can offer the job to candidates based on certain keyword searches. This job seeker management feature allows companies to perform candidate data collection such as sorting, rejecting applications, offering job positions to be able to blacklist against certain candidates. Karirpad ATS as a recruitment system also seeks means of connecting companies with job seekers through an integrated system that can be accessed through various desktop devices (laptop / computer / pc), smartphones to tablets. 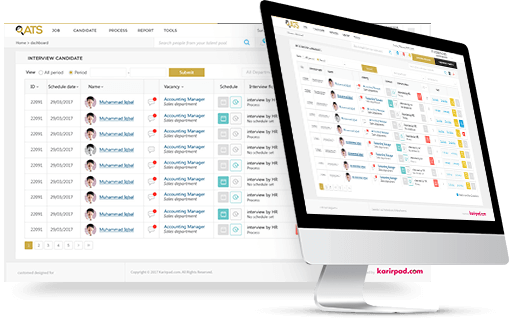 Easily manage the data of recruitment candidate candidate company work with us which has been trusted by many big company in Indonesia. Creating and customizing the course of recruitment you want is the main objective that We have provided so far to the clients of various industries in the country. Your company can track and view the history of each recruitment process, so there is no double processing of candidates and the data provided can be the decision making material for recruiting the best candidates you may have found through the Career recruitment system. There are many processes that you can incorporate in the Recruitment Process Management feature, ranging from job interview scheduling sessions / job interviews, contract offerings through the system to employee recruitment / agreement between job seekers and companies. 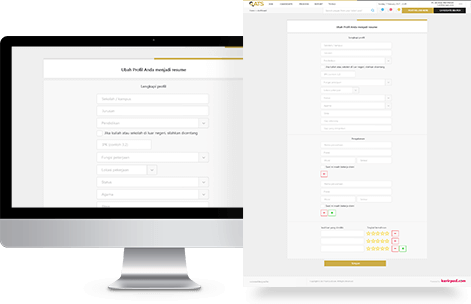 All can be done only through a complex recruitment system from the Karirpad Applicant Tracking System. 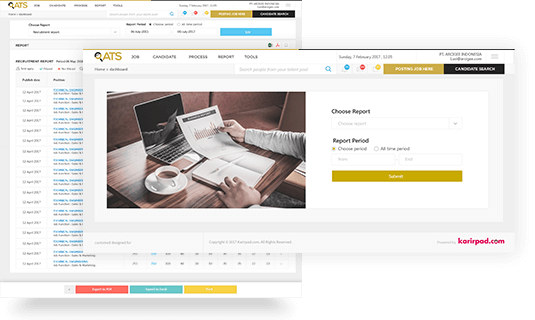 The report recap feature of the Applicant Tracking System (ATS) helps your company to collect, prepare and review reports of all the recruiting processes that are currently in operation. There are dozens of reports that you can generate through employee recruitment & selection systems including job vacancy reports, total vacancies that have been opened along with their data details, recruitment reports, interview / interview reports, candidate reports received / in waiting / rejection periods until summary reports of all processes that are displayed in both form and graphic form. In addition to the various reports that have been categorized, the Company can also make reports of specific recruitment process / custom directly assisted by the experts we have. Specific features for recruiters include candidate data manually derived from referrals of employees or co-workers from other companies. With this feature the company gained special access to privately record the profiles of candidates who wish to be recaptured and become one with other candidate data already in the Applicant Tracking System. Job seekers / candidates who will apply for your company job vacancy will be directed to your career site. With this career site, your company has its own personal portal that looks professional and can give a special impression to the job seekers who certainly increase their enthusiasm and make your company's existence increase. Features career site is built in accordance with the concept and character of your company so that will not eliminate the value or impression to be published to the outside community. Many doubted if a company does not have their own exclusive job exclusives, and this is where the career comes together to build the best impression for your company in the eyes of thousands of job seekers in Indonesia.